Canaan Tarasenko found his forever home with Debbie & Jami in Fairfield, pictured are Romeo, Molly and Soul. 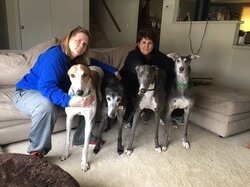 This family has been members of GAGC for many years, they are the reps at the Tri Cty Petsmart every month, and always thinking of ways to help our mission in finding good homes for these greyt dogs. I'm sure if you attend our events you'll get to meet their new family member.